Follow the steps below to copy segment AB: 1. Use the line tool to construct line m below segment AB 2. 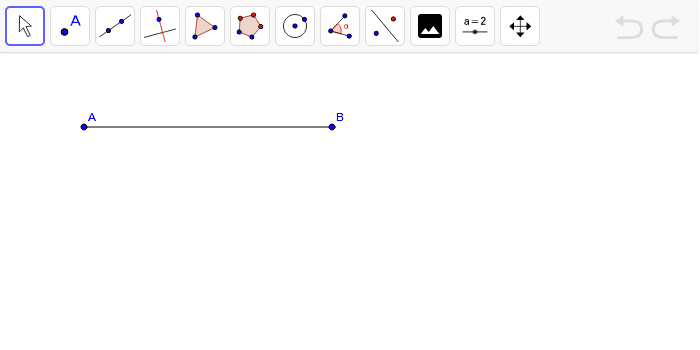 Use the point tool to construct point E on line m. Right click on the point to show its label. 3. Use the Compass tool to measure the length of segment AB, then click on Point E to center the Compass tool at that point. 4. Construct Point F at an intersection of line m and the circle you just constructed. 5. Hide everything in your sketch (right-click, Show Object) except for Points A, B, E and F and segment AB. 6. Use the Segment tool to construct segment EF. 7. Drag things around in your sketch and observe what happens.